Alpha is a ten week course on the basics of the Christian faith, providing an opportunity for anyone to explore the Christian Faith in a relaxed setting, with the aim of enabling people with a “spiritual hunger" to encounter the Christian Gospel in a life transforming way. The course is being run around the world by thousands of churches in all major Christian denominations. 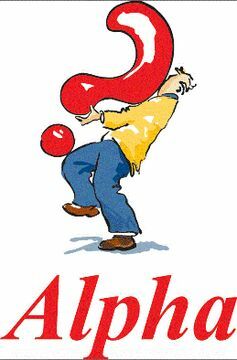 Many people have come to know and love the Lord through the ten week Alpha course. The course is run for those seeking to know more about the Christian faith and has been run two or three times each year at church since 1996. Each weekly session begins with a meal or refreshments - a chance to get to know others in the small group. There is then a short talk, which looks at a different aspect of the Christian faith each week. This is followed by a time of discussion in the small groups, where everyone is welcome to contribute their opinion, ask questions and discuss with the rest of the group. The emphasis is upon exploration and discovery in a relaxed and informal environment.